CORAL SPRINGS, Fla. (AP) — Roberto Luongo has an arena named after him. He has made roughly $100 million in career earnings, knows he is headed to the Hockey Hall of Fame one day, ranks among the sport’s all-time leaders in virtually every goaltending category. And in a true testament to Luongo’s popularity, the Twitter account of his alter ego even has close to a million followers. The Panthers will gather Thursday for their preseason media day and some off-ice matters, then open training camp on Friday. They were one of the hottest teams in the NHL in the second half of last season, and wound up missing the playoffs by a point in another woebegone chapter for the franchise that hasn’t qualified for the postseason in 15 of the last 17 years and hasn’t won a playoff series since 1996. He didn’t use the word Vancouver, because it was obvious. 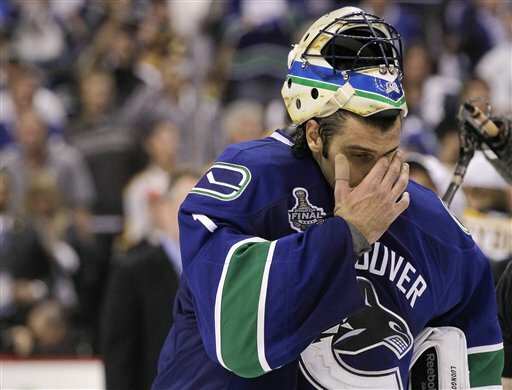 After his first stint in Florida ended in 2006 Luongo spent eight years with the Canucks, lost a Game 7 of the Stanley Cup final with them — in Vancouver, no less — and eventually wound up getting traded back to the Panthers. He was miserable toward the end of his time in Vancouver, lost his starting job and the $64 million, 12-year contract he signed in 2009 was an easy target for critics. That’s the self-deprecating humor that he’s needed to develop, and is often in full display on his Twitter account Strombone . He was healthy this offseason, a change from the last couple years, and that allowed him to spend much more time honing and much less time rehabbing. He took about a week or two off after last season, forced himself to watch some of the Stanley Cup playoffs, and believes he’s ready for the grind that awaits.